In an era when portraiture was the primary subject of colonial painters in America, Copley set an unprecedented standard for conveying both the physical and the psychological presence of his sitters. 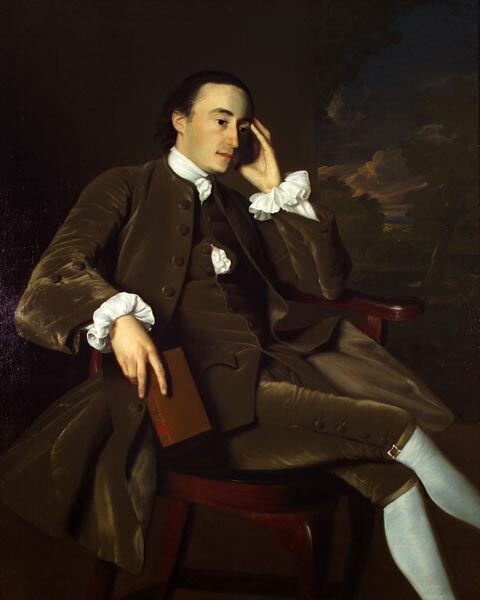 One of five portraits by Copley in the Museum's collection, the characterization of John Bours (1734-1815) is striking for its informality. A respected citizen of Newport, Rhode Island, and a devoted member of that town's Trinity Church, Bours is portrayed as a man of quiet intelligence in an introspective, pensive moment. This intimate likeness is rendered convincingly with a rich array of textures: the soft, brown velvet suit and crisp, white cuffs; the hard sheen of the mahogany chair; and the freely brushed landscape vista. Copley's artistic achievement is all the more extraordinary considering that the colonies offered no opportunities for formal training for native-born artists. Instead he had to glean what lessons he could from engravings of fashionable British portraits, through occasional correspondence with artists abroad, or from the canvases that he could see in America. Just over a decade after completing the portrait of Bours, Copley left behind lucrative patronage in Boston, Newport, and New York to pursue greater artistic ambitions as a history painter in Europe and England.